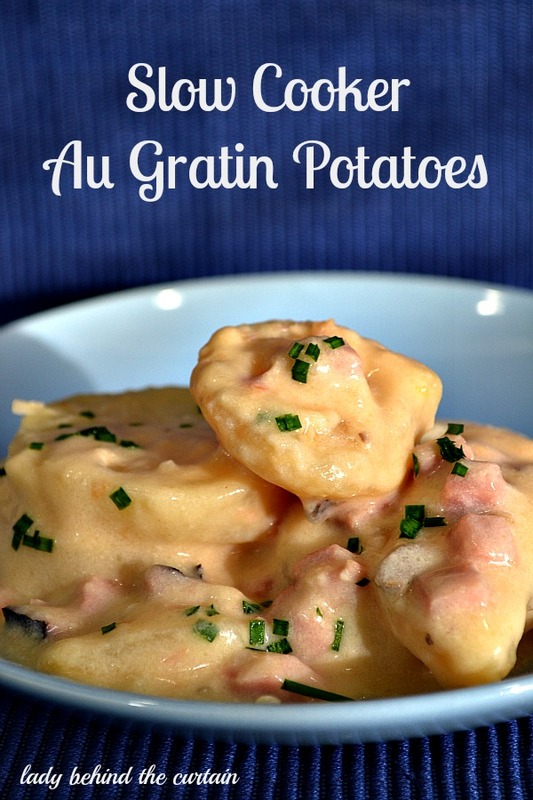 Slow Cooker Au Gratin Potatoes | These potatoes are creamy and full of flavor. The perfect side dish for Thanksgiving, Christmas or Easter. To make it easy on me I make these the day before Christmas and warm them up in the slow cooker for our Christmas dinner. A great way to use up leftover ham! This year to lesson some of the stress of getting everything ready at the same time I chose to make these potatoes instead of mashed potatoes. I was so happy I did! Sometimes it’s nice to change up the menu a bit and the Grand kids loved them! Layer potatoes, salt, onion, cheese and ham. Mix together the soup and 1 can filled with milk. I seriously LOVE this kind of potatoes! I’ve never made them in the slow cooker before, though. Can’t wait to try this! These look SOOOO good 🙂 Visiting from Mix it up Monday. yum, this looks super tasty! Thanks so much for linking up to Tasteful Tuesdays at Nap-Time Creations. Just wanted to let you know that you will be featured at this weeks party! love this but I can’t eat mushrooms so I use cream of chicken great. Yes, my husband loved them, as everyone else. As my family says, “it’s a keeper! It really turned out great, and I didn’t change a thing. Thank you. Hi Bob, I think it will serve approx. 10. Can you use Carnation canned milk in place of the regular milk? Hi Amber, I wouldn’t…I only say that because I don’t like the flavor of canned milk. If that’s what you prefer then yes you use canned milk.